The Pen Chalet 20 wooden pen case can hold up to twenty oversize pens. The display case has two velvet lined trays that each hold ten pens in individual slots. The top tray is accessible with a sturdy, decorative hinged lid with the pens viewable through the clear top. The bottom tray pulls out and is removable. The Ebony color has a wood grain veneer overlay while the black is a smooth veneer. The Pen Chalet 20 Pen Display Cases usually ships within 1 business day unless otherwise specified. 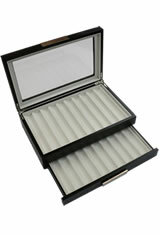 Each Pen Chalet 20 Pen Display Cases we sell is guaranteed to be genuine, authentic and will arrive brand new & unused! The pen case is solidly made with room for even my largest pens. It is an attractive way to display and store pens.